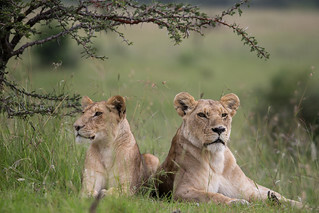 KENYA, Masai Mara: In a photpgraph taken by Make It Kenya 08 January 2016, a lioness and sub-adult member of the Enkuyeni Pride of lions looks out through the surrounding bush in the Olare Motorgi Conservancy bordering tha Masai Mara National Reserve in Kenya. The country’s famous wildlife is being showcased with two world firsts in a series of live web broadcasts using new state-of–the-art technology. #KenyaLive enables people to witness the excitement of a night safari in the Mara – as well as Kenya’s coastal underwater treasures - as the action happens in real time. Building on the success of #MaraLive - the world’s first live web broadcast of the great wildebeest migration - Make It Kenya has again partnered with HerdTracker to use a combination of the most innovative filming technology, and Twitter’s Periscope app, to give people around the world unprecedented access to some of the most exciting and rare animal behaviours, with 50 live broadcasts over 11 days. MANDATORY CREDIT: MAKE IT KENYA PHOTO / STUART PRICE.